I've bought the wrong bike, but that's OK - I've been doing it for the last 10 years. It all started with my first 'real' bike - a Ribble winter bike. I loved it, it was the swishest, fastest bike I'd ever owned. I wanted more, so bought a carbon framed race bike. It was my weekend warrior steed, my best bike. Loved it so much that I rode it all winter as well and ended up wrecking it. Back to alloy I went, upgrading piecemeal until I felt I had the best, all-round bike I could afford. And then I upgraded it again, but although it was the bike I wanted, it wasn't the bike I needed. 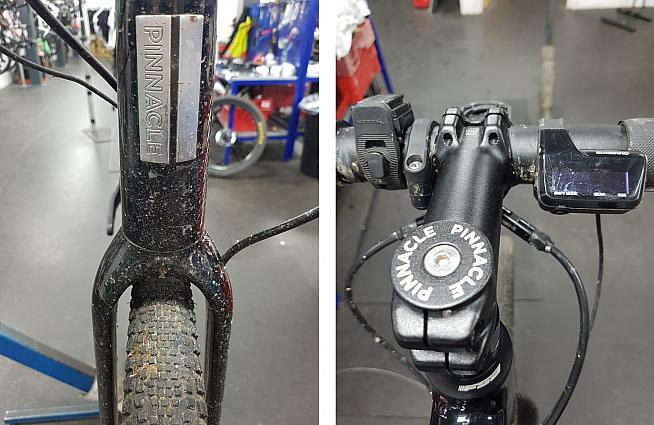 Spoiler: Andy's new bike is the Pinnacle Arkose with Shimano XT Di2 shifting. After hitting the nail squarely on the head when I decided to buy a mountain bike (I love my Trek Roscoe) I began to think more about what I was trying to get out of my rides. I have neither the desire, nor the talent, to race along at 30km/h. I climb less like a mountain goat and more like a mounted trout. My descending is as much driven by gravity as it is by ability, and the closest I get to aero is the chocolate with the bubbles in it, and I do with alarming frequency. 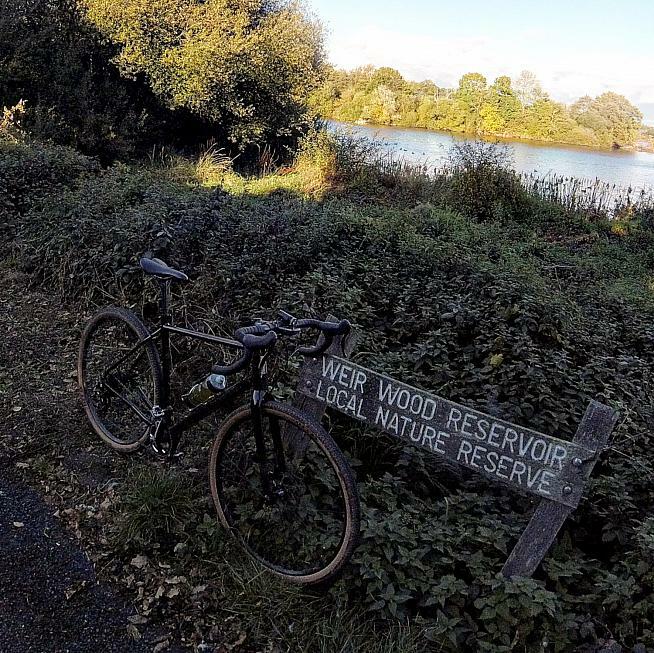 I decided to try another Sportive Cross ride like the one I did in February on the excellent Pinnacle Pyrolite, but this time the guys at work (Evans Cycles) lent me a 1 x 11 steed in the shape of the Arkose. This bike has been designed to accommodate many different requirements. The relaxed geometry and facility to mount 'guards, racks and extra bottle cages mark it out as an ideal tourer. The frame has massive amounts of clearance, good for up to 45c with the 700c wheels it's supplied with, and knocking on the door of 47c when running compatible 650b hoops. Add to this a 1 x 11 drive train, giving a better than one-to-one ratio for climbing, and powerful TRP Hylex hydraulic brakes, it all adds up to a really versatile and impressive package. The cherry on the well-baked cake was the inclusion of Shimano's XT Di2 shifting through a set of easy to operate 'climbers' buttons along the side of the right-hand lever. I was dubious when I first tried it - it looked so, well, normal - apart from the massive WTB Riddler tyres and their like-or-loathe tan-walls. All that air holding you up makes the ride supremely comfortable and almost floaty. Despite the tyres' size, they roll superbly and grip like glue to tarmac, shrugging off the road imperfections on my commute imperiously. In fact, I now no longer have to avoid the kerb drops, potholes and drains that try to sabotage my ride in and home again. 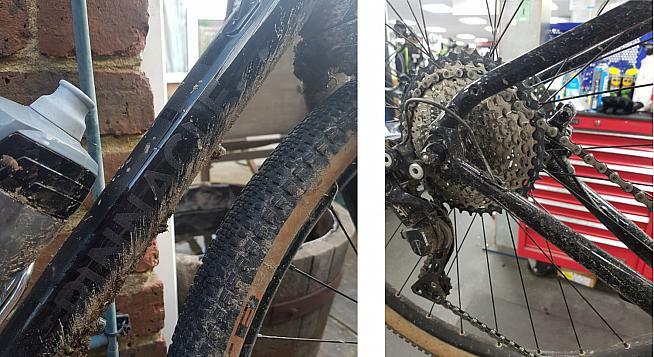 Shimano's XT electric shifting performs even in filthy conditions. A single chainring and plenty of clearance for wide tyres. 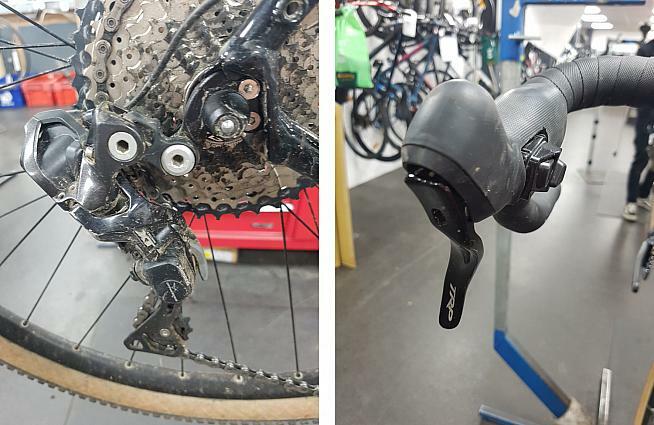 A closer look at the XT Di2 shifter. The saddle is based on the popular Charge Spoon. The 40T front cog and the almost psychic nature of the gear changing gives this bike the feel and fun of a single-speed. You hardly notice the effect of gear changes, as the close ratio of the rear cassette helps you maintain a steady, comfortable cadence and flattens any ups and downs if they're not too severe. When the gradient gets especially challenging, the Arkose climbs as well as any of my bikes have (with or without me on them). The almost old-fashioned look of the frame fools you into thinking you're plodding along when in fact you're comfortably clicking off the kilometres, regardless of the state of the road. 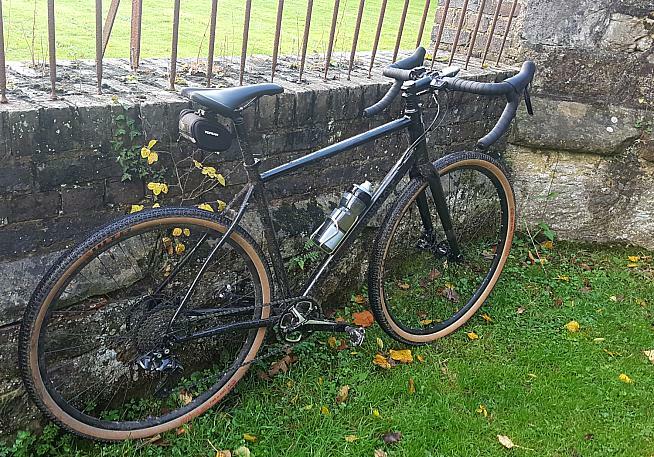 The road isn't all what this bike is about, however - hop the kerb and head for the woods and the Arkose is just as much fun, just as comfortable and more than capable of tackling moderately difficult single track. The only limit the Arkose reached, apart from the limit of my judgement, was that of the grip on the up-until-now excellent Riddlers. Throw on a pair of CX tyres and you would be back with a main course of grip, with a side order of comfort and control. Even the saddle, modelled, I'm told, on the ubiquitous Charge Spoon, offers more than adequate support of my more than adequately proportioned posterior. The Pinnacle Arkose is available in a range of builds with prices starting at £787. So - the Arkose climbs the way I climb. It cruises along the way I cruise along. It off-roads within my limits. It descends smoothly and precisely, just like I aspire to. Once the rhythm of my knees bashing my muffin top causes a resonance akin to the legendary Brown Note, I stop pedalling and start to coast, so I have no need for a sprinter's set up. The Di2 display even tells me what gear I'm in. The only thing that this fantastic package lacks is a rear through-axle to match the one that provides additional strength to the carbon fork up front. 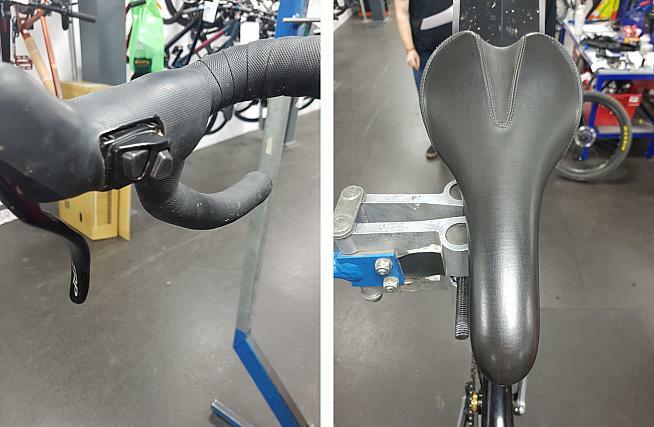 This is an oversight that will be rectified with the Arkose's 2019 frame redesign, along with bridgeless seat stays. There is, however, a sad twist to this tale. The Arkose LTD I'm riding was built up as a limited edition to celebrate the 10th Anniversary of the Pinnacle brand. You can't buy the XT Di2 version of this bike for ready cash at any branch of Evans (unless you're a 'Medium' sized woman - still one of those in stock on the website). 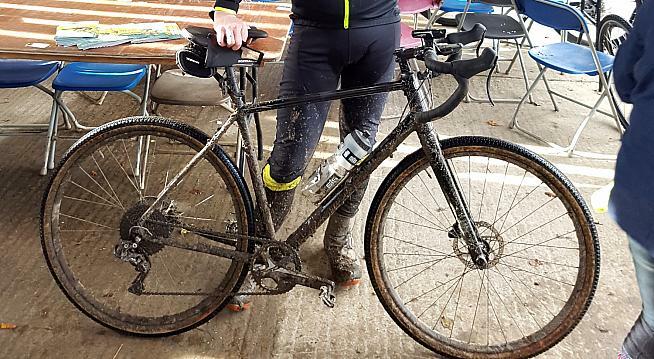 I'm fortunate enough to be riding the bike that used to belong to the design team and will naked mud-wrestle anyone who takes it away from me. Do not despair, though. The 2018 Arkose 4 and Arkose X also come with a one-by set-up and hydraulic brakes, the former boasting a SRAM Rival groupset and the X, a Shimano set-up with a bar-end changer and TRP stoppers. With this set-up proving ever more popular with adventure riders, expect the 2019 range to have such an option. For those that still like a double ring up front, the entry-level Pinnacle Arkose 2 comes with 9-speed Sora and TRP Spyre mech discs and the exact same frame geometry as the range-topping LTD and 4 models. There are Tiagra and 105 versions available also, both of these with those fugly RS oh-5 shifters to give some mineral strength to the rotors. Until the next time I decide I've bought the wrong bike, I'll be happily ploughing my way through winter mess, on- and off-road on the Arkose. Come the Spring, I'm going to change the tyres to faster rolling, but equally massive WTB Horizons and take in some road sportives, maybe even try the Cols in the Lake District. I'm keen to prove myself wrong (again). Pinnacle Arkose Adventure Road Bike, from £787 at www.evanscycles.com.